4. 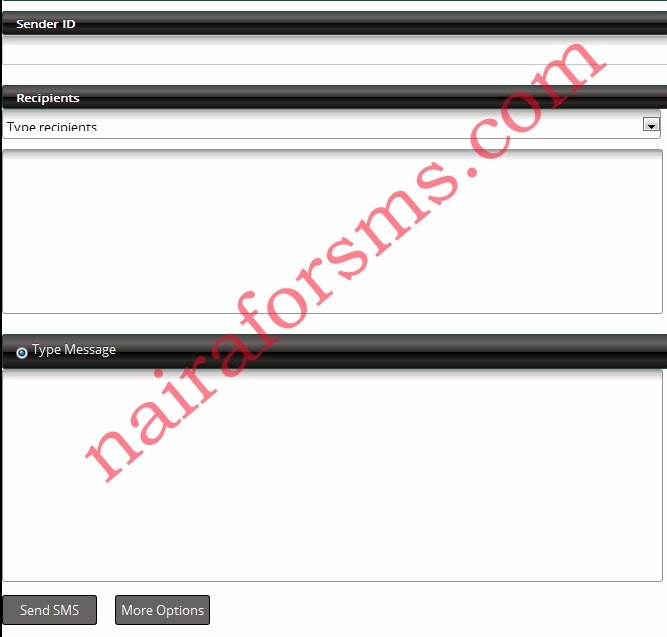 In the "Sender ID" box, enter the name you want to be displayed on the receivers' screen eg NairaForSMS. It must not be more than eleven (11) characters. This include space between letters. 5. In the "Recipients" box, enter the phone numbers you want to text (in the format: 2348060000000 or 08060000000). Separate multiple numbers with comma or put each number on a separate line. Duplicate and invalid numbers will be automatically removed and not charged. 6. Type your message in the "Message" field. Single text message contains a maximum 160 characters. 2 pages will cost you 2 sms. 7. Click on the "Send" button. You can click on "Message history" link in the menu to track your sms history and status. NOTE: If you click the "More Options" button via the "Send" button, you will be able to save your message as draft, save the recipients to a phone book and schedule the message to be delivered on a later date/time. Remember, you must have enough sms units in your account for you to send sms. If not, buy sms before you send your messages.